Update February 2008- Geometric 3-4-2 wins an honourable mention in the 2008 Wearable Expressions Exhibition. Update July 2007- this bracelet won 1st place in the bracelet category of the 2007 Bead Art Awards. 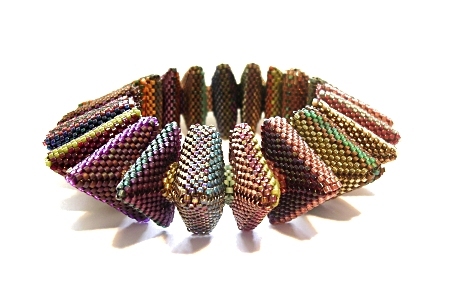 This bracelet was the second triangular one of this style I beaded and forms part of my Geometric Beadwork Series. The first used a lot bolder colour and pattern, and I wanted to change the look for the second. After visiting the Milwaukee Art Museum and seeing some of the architecture there, coupled with the Dale Chihuly piece in the foyer, I had my inspiration. This pieces uses 87 different colours of delica bead and I choose each one as I went along, learning a lot about colour and placement in doing so. You can see some of what I learnt here. I also played around with the width of the triangles in this piece, varying it between 1 and 7 rows as I went along. There is a different colour used on each triangle 'side', in the spaces between each triangle, and on each triangle 'edge'.